FREE SHIPPING on all Orders in USA over $200.00. New from Chilton and in stock. This book covers SUV's from 22 manufacturers listed below. By far, the best deal for repair information if you have one or more SUV's. 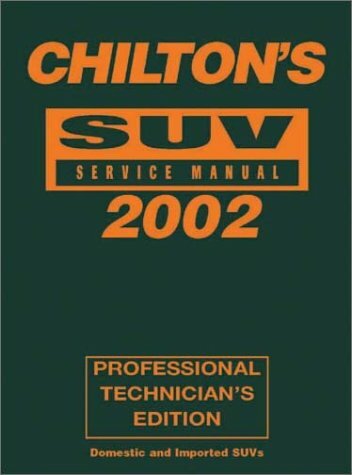 Designed for the professional & home based mechanic, Chilton Service Manuals are comprehensive and technically detailed, offering TOTAL maintenance, service and repair information for the automotive mechanic. Information is provided in an easy-to-read format, supported by quick-reference sections, as well as exploded view illustrations, diagrams and charts. Each hard-cover manual offers complete coverage of repair procedures from drive-train to chassis and all associated components. All this at the user's fingertips ensures fast, accurate repairs.